On July 21, 1915, Boston Red Sox rookie Babe Ruth struck a prodigious drive that sailed far over the right field bleachers at Sportsman's Park in St. Louis. The ball cleared the wide breadth of Grand Boulevard and landed on the sidewalk approximately 470 feet from home plate. 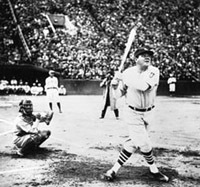 That was the start of modern long-distance hitting, and a testament to Ruth's uniqueness that he was able to set objective standards of performance that have never been surpassed. 1) "Tale of the Tape” uses a mathematical formula based on a highly detailed architectural map of the baseball stadium to calculate the distance a ball would have traveled if it hadn't hit any obstruction. Despite being a mathematical method, the "Tale of the Tape" is still just a best estimate. 2) Dimensional Tracking software programs, such as “True Track,” introduced by SportVision, the same company that makes the Virtual First-Down Line in football, True Track utilizes specialized cameras – calibrated with known points in the stadium – to track a baseball and produce a virtual 3-D grid, calculating where a fly ball is in relation to that grid. A final home-run distance can be calculated instantly using the position of the ball and the position of home plate in the grid. Utilizing a combination of these two technologies, and historical data about the stadium layouts and dimensions where homers were hit, experts have proven that members of The 500 Home Run Club® not only provided some of the most memorable long ball moments, but also some of the most monstrous round-trippers of all time. Mickey Mantle, Yankee Stadium –– The ball Mantle called the "hardest ball I ever hit" came on May 22, 1963 in the 11th inning versus the Kansas City A's. Pitcher Bill Fischer tried to blow a fastball past “The Commerce Comet” and immediately realized he’d made a big mistake. “The Mick” hit a liner to right field that struck Yankee Stadium’s outfield facade just inches from the top, barely sparing him the distinction of becoming the only man ever to hit a fair ball out of the historic ballpark during a MLB game. According to HitTrackerOnline.com, the true distance of the Mantle "facade" homer at 504 feet. The “Splendid Splinter” Ted Williams, Tiger Stadium –– On May 4, 1939 Ted Williams cleared the towering right-field grandstand in Detroit and served notice he was as powerful as he was refined with a bat. As late as 1960, Teddy Ballgame was still going strong, when he opened the season in Washington with a 475-foot bolt to right-center field. "Mr. October” Reggie Jackson, Tiger Stadium –– On July 13, 1971, Reggie Jackson blasted what almost certainly was the longest All-Star homer of all time. Jackson's line drive off Pirates’ pitcher Dock Ellis cleared the right-center field roof and hit near the top of a 100-foot tall electrical transformer, about 380 feet from home plate. The ball vanished from the camera focused on Tiger Stadium’s upper deck (a reasonable place to look for a normal home run), and dropped back into frame after 4.8 seconds. Hit Tracker data combined with atmospherics proved the ball would have traveled an incredible 532 feet. 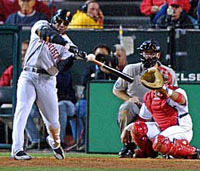 Barry Bonds, Angels Stadium –– On Oct. 26, 2002, leading off the sixth inning of World Series Game 6, San Franciso Giant Barry Bonds crushed a pitch from the Angels ace reliever "K-Rod" Francisco Rodriguez, deep into the right field seats for his fourth World Series home run. Bonds' historic and epic shot has been estimated at 485 feet. 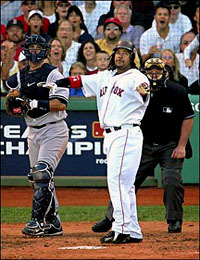 "Manny Ramirez, SkyDome, June 3, 2001 –– In 2001, Red Sox slugger Manny Ramirez hammered a pitch from Toronto's Chris Carpenter into the 5th deck of SkyDome’s left field stands, which was reported as having traveled 491 feet. But Hit Tracker analysis suggests it did not go nearly that far. With the roof closed, Skydome atmospherics were a comfortable 68 degrees, with no wind and 270 feet of altitude. The landing spot was 399 horizontal feet from home plate, at a height of approximately 73 feet above field level, and the time of flight was 4.91 seconds. With these parameters, Hit Tracker says Ramirez' homer covered 447 feet. Editor’s Note: Any 400+ feet homer is noteworthy and a blow of 450+ feet shows exceptional power, since most MLB players are unable to hit a ball that far. Anything in the 500-ft range is genuinely historic. Between 1982 and 1995, only one 500+ foot drive was confirmed by the "Tale of the Tape." system: Cecil Fielder of the Detroit Tigers is credited with powering a ball 502 feet in the air over the left-field bleachers at Milwaukee's County Stadium on September 14, 1991. For a list of the longest hits in MLB ballparks,visit CBSsports.com.